Heroin self-administration training and extinction of drug-reinforced responding. A, Mean ± SEM number of infusions and active and inactive lever responses during the 12 d of heroin self-administration training (total n = 62). B, Mean ± SEM number of presses on the active lever and inactive lever during the first 12 extinction sessions conducted in the absence of heroin in a different (extinction) context. Effect of unilateral muscimol + baclofen injection into ventral mPFC combined with either contralateral or ipsilateral SCH 23390 injection into medial accumbens shell on context-induced reinstatement. A, Reinstatement. Shown are mean ± SEM number of presses on the active lever after unilateral injection of muscimol + baclofen into ventral mPFC and contralateral (left, n = 11 per group) or ipsilateral (right, n = 6 per group) injection of SCH 23390 into medial accumbens shell before exposure to the Heroin context or the Extinction context. B, Cannula placements and representative pictures. Approximate placements (mm from bregma) of the injector tips for ventral mPFC and contralateral (left) or ipsilateral (right) medial accumbens shell (Paxinos and Watson, 2005) and representative photomicrographs of cannula placements are shown. Because implantation of cannulas into the left or right hemisphere was counterbalanced, injector tip placements are depicted in both hemispheres. *p < 0.01, different from the Vehicle condition. Effect of unilateral muscimol + baclofen injection into ventral mPFC or unilateral SCH 23390 injection into medial accumbens shell on context-induced reinstatement. 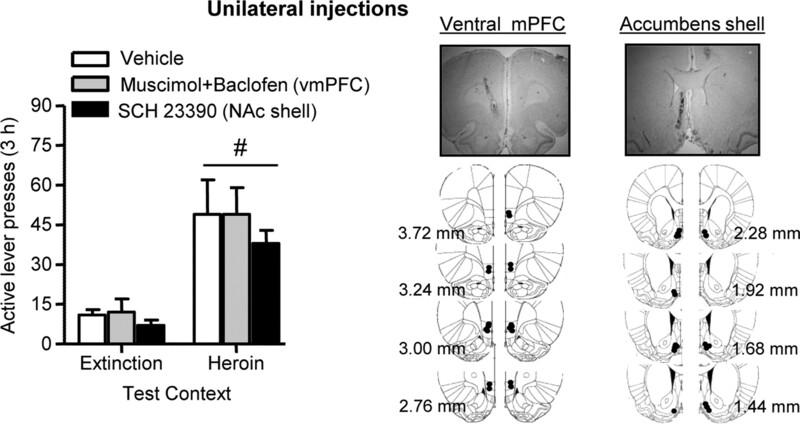 Left, Mean ± SEM number of presses on the active lever after either unilateral injection of muscimol + baclofen into ventral mPFC or unilateral injection of SCH 23390 into medial accumbens shell before exposure to the Heroin context or the Extinction context. Right, Cannula placements (see Fig. 2 legend for details). #p < 0.01, different from the Extinction context, n = 6–7 per group. Unilateral injection of FG into accumbens shell and colocalization of FG with Fos in ventral mPFC after a context-induced reinstatement test. A, Reinstatement Test (left), Total number of active lever and inactive lever presses in rats tested in the Extinction (Control A-B-B) or the Heroin (Renewal A-B-A) context. *p < 0.05, different from the Extinction context, n = 4 per group. FG injection site (right), Representative photomicrograph of unilateral FG injection into accumbens shell (left, 5×) and FG labeling in mPFC (right, 5×). NAc, nucleus accumbens; Cg1, anterior cingulate; Prl, prelimbic; IL, infralimbic. Red squares indicate area of FG and Fos quantification. B, FG-IR cells: Number of FG-IR cells per mm2 in ipsilateral and contralateral ventral mPFC of rats tested in the Extinction or Heroin context. #p < 0.01, different from contralateral, n = 4 per group. C, Fos-IR cells: Number of Fos-IR nuclei per mm2 in ipsilateral and contralateral ventral mPFC of rats tested in the Extinction context or the Heroin context. *p < 0.01, different from the Extinction context. D, Fos +FG double-labeled cells: Percentage of Fos + FG-IR cells in the ipsilateral and contralateral ventral mPFC of rats tested in the Extinction context or Heroin context. *p < 0.01, different from Extinction context. 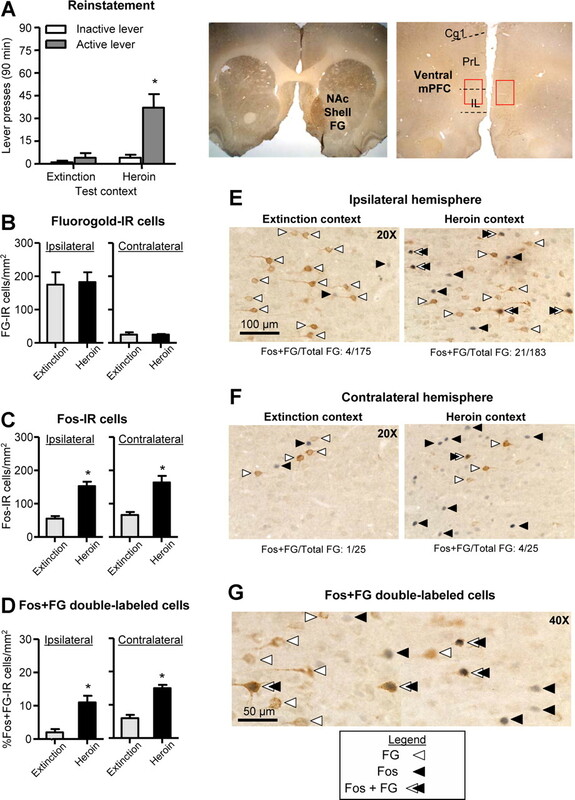 E, F, Representative photomicrographs of Fos and FG cells in ipsilateral (E) and contralateral (F) ventral mPFC of rats tested in the Extinction or Heroin context (20×). G, Representative photomicrograph of ventral mPFC of a rat tested in the Heroin context (40×). White arrows indicate FG-positive cells, black arrows indicate Fos-positive nuclei, and white/black arrows indicate Fos + FG double-labeled cells. Scale bars: (in E), E, F, 100 μm; G, 50 μm.